In the floating city of Sanctaphrax, fusty old professors scheme and bicker with each other as they study the weather in minute detail—mistsifting, fogprobing, researching the air blowing in from beyond the Edge. But some experiments are best left alone. . . .
Quint is the son of a sky pirate captain. He arrives in Sanctaphrax at the request of Linius Pallitax, the Most High Academe, who needs an apprentice he can trust to carry out a series of highly important tasks. Just how important, Quint is about to find out as he and Linius’s only daughter, Maris, are plunged into the midst of a terrifying adventure that takes them deep within the rock upon which Sanctaphrax is built. Paul Stewart is a highly regarded author of books for young readers, most notably the bestselling Edge Chronicles. He lives down the street from Chris Riddell in Brighton, England. 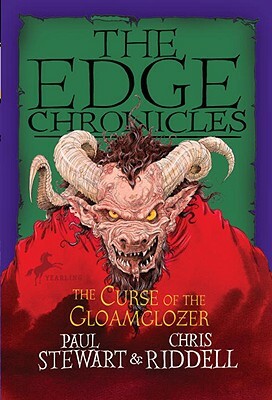 Chris Riddell, co-creator of the Edge Chronicles, is an award-winning illustrator and political cartoonist. He lives down the street from Paul Stewart in Brighton, England.